People such as Gwen Holmes are basically doing triage work in a desperate attempt to keep the Lakota language and culture alive in the United States. 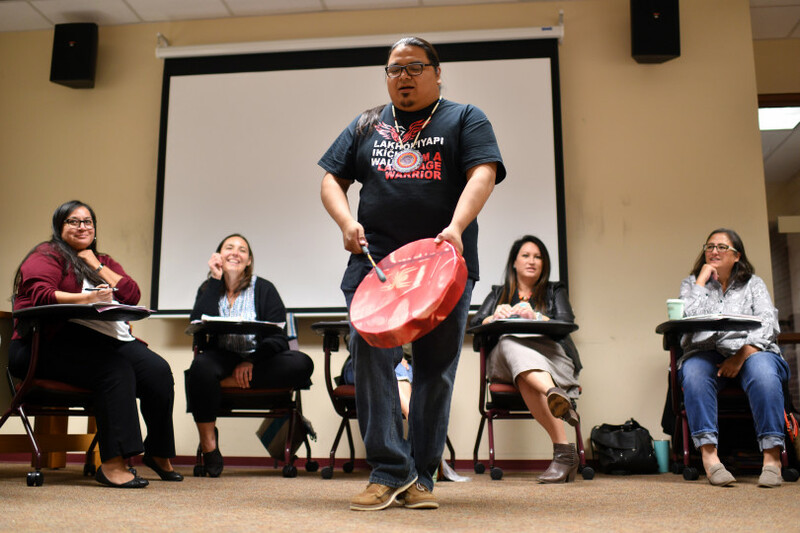 “I wouldn’t say it’s extinct, but it’s definitely endangered,” the soft-spoken Holmes said Saturday during a Lakota Language Weekend at the University of Denver. Lakota Language Instructor Allen Wilson, front, is teaching the language with the rhythm of drum Oct. 20, 2018. The Lakota Language Weekend, a crash course on Lakota language and culture is being held at the University of Denver. The workshop was open to people of all backgrounds, and geared towards beginners. Students learned basic vocabulary, grammar and practical sentences for everyday life. Read the full story published by the Denver Post here.